Red Sonja: Sanctuary is a sequel to the one-shot Red Sonja: Raven. I never wrote a formal review of that story but I did read it and my memories of it are not fond ones. Thankfully, the title page of this issue summarizes that story for anyone who missed it or can't remember it. Tracking a series of brutal crimes, Sonja discovered Raven, a young woman who had also been blessed by the goddess Scathach to act as her sword arm. Unfortunately, where Sonja uses violence in a measured manner, Raven is a blunt-force instrument, willing to kill the innocent and even the young in order to assure that women are no longer threatened by the evils of men. Though over-matched in speed and strength by her younger counterpart, Sonja managed to defeat Raven, leaving her bereft of everything. Everything, that is, except for the company of a young girl named Eleanor, who had sworn to take Raven's life herself in order to avenge her father's death at Raven's hand. As this comic opens, a gang of mercenaries seeks to bring Raven to justice for her past crimes. Sonja beats them up, tracks Raven down herself and finds that Stockholm Syndrome has set in for young Eleanor. Eleanor has forgiven Raven for killing her dad and the two decided to establish the Hyborian equivalent of a women's shelter. After thrashing the mercenaries a second time and stealing their clothes after warning them to stay away from Raven, Sonja decides to join the family and forswear her own life of violence. At least until something goes wrong and she has to pick up her sword again because, honestly, we all know Sonja remaining a pacifist isn't going to stick! Marc Mason's script is serviceable but not nearly as ambitious as it could have been. For one thing, nothing is said of the fact that Sonja abandons her oath to live a warrior's life in order to protect others. Granted, she finds another way to try and help others but it seems odd that Sonja wouldn't agonize over the choice a little more or ask her goddess for approval. This is doubly vexing given that - in the previous chapter - Sonja was able to commune with her goddess and get direct answers to her questions. Of course, the idea of anyone being able to speak to the gods in a Hyborian setting is another can of worms that may upset Howard purists. The biggest problem with the story is Raven herself and her lack of real character growth. Given that Raven's base goal in this story is identical to her goal before (i.e. 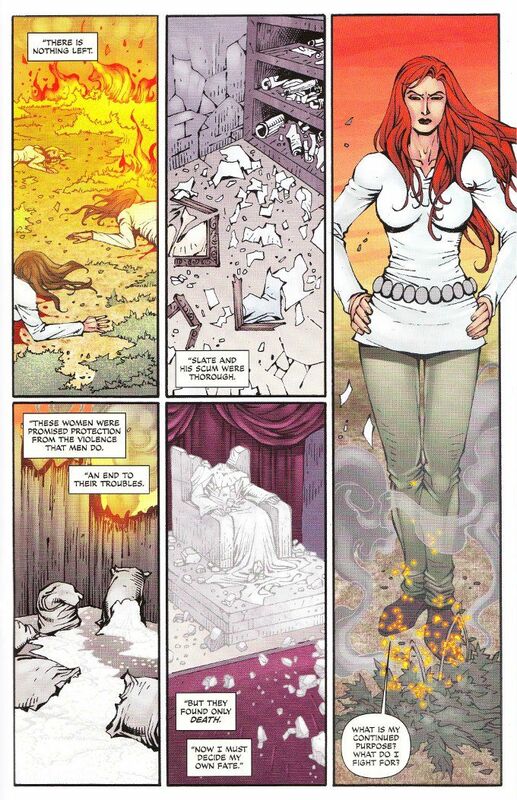 build a place where women can thrive without being exploited by men), comparisons could have been drawn between Raven's old violent separatist methods compared to the more peaceful separatist ideology she adopted after her reformation. A point could have been made about how separatism - peaceful or war-like - fails to address the issues that made it necessary in the first place. Unfortunately, such complexity seems beyond Mason, whom I don't think had any message in mind for this story beyond "Raven is kind of nuts." Thankfully, the artwork by Noah Salonga is a definite improvement upon Red Sonja: Raven, which featured close-ups on the female characters's posteriors when they were speaking and appeared to have been inked with a black Sharpie marker at points. Salonga's work is subtle. His figures are lean and angular, suggesting a speed that fits well with the fast-paced story. 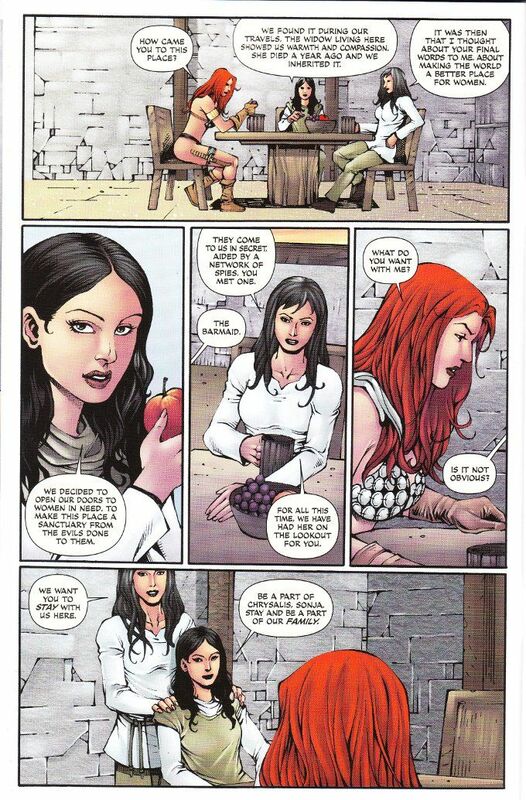 I enjoyed Salonga's previous work on Legends of Red Sonja and with any luck he'll be tapped to draw more adventures of the She Devil in the future. All in all, Red Sonja: Sanctuary is not a bad comic but it is a problematic one. The artwork is good but there much more could have been done with the story. Thankfully, the ending is open enough to allow for a third part to this story. Perhaps Marc Mason will address these issues there.